There are 16 non-financial audits in this series published by Triarchy's sister company Cambridge Strategy Publications. They are designed to cover many areas of your business, including strategy, general management, marketing and PR, and human resources. Together they make up a portfolio of company self-assessment tools. Then you can run the audit again to measure improvement and refine the process. Ensure that you have the systems and processes in place to implement your overall strategy. Authors of these self-assessment audits include top-flight consultants like A.T. Kearney, Arthur D. Little, SRI, Accenture, Mckinsey and many more. 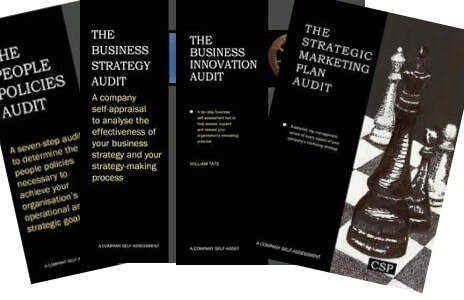 If you commissioned any of these state-of-the-art audits from them yourself, you would pay £5,000 or more for each one. Here, they cost just £55 each. Each self-assessment audit is a stand-alone business improvement tool and includes a detailed guide to the self-assessment process. You can run these audits immediately without any external support or training. ​See a list of customers and what they have said. Read ​Organisational Change: Communicating Change ~ an extract from The Organisational Change Audit.